Happy Birthday, Pick A Charity: Are Facebook Fundraisers All They Seem? 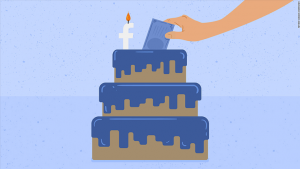 Facebook recently introduced the birthday fundraiser; users now have the option to start a fundraiser for any of Facebook’s 750,000 nonprofits to honor their birthday, and can invite their friends to donate. While this has raised a significant amount of money for numerous nonprofits, the efficiency of these public fundraisers is still questionable. Personally, I am, what you would call, a birthday person. I absolutely adore birthdays and everything that comes with them, and start planning my own birthday months in advance in order to ensure that I enjoy the day to the fullest. Evidently, Facebook loves birthdays too. While I was scrolling through my newsfeed the other day, something caught my attention: in honor of my upcoming birthday, I could start a fundraiser for one of Facebook’s 750,000 chosen nonprofits, and Facebook would donate $5 in my name. Facebook first introduced fundraisers in 2015, developed the function to include donate buttons in posts in 2016, and created the birthday fundraiser in June 2017. Since its debut, birthday fundraisers have raised over $300 million for Facebook’s selected charities, ranging from causes such as cleaning and preserving the ocean to reuniting immigrant children with their families after being separated at the border. While Facebook used to keep 5% of all donations, the company has since decided to waive all fees (making an exception for personal fundraisers) to ensure that nonprofits receive the full donations. The fundraisers have to be shown publicly on users’ profiles; users who create one do not have the option to keep the fundraiser visible to their friends alone (donations can be made anonymously, however). Online fundraising has proven to be quite successful, as nonprofits are able to benefit from the network effect; meaning, reaching wider audiences through individuals’ group of friends and friends of friends (Saxton and Wang 854, Luarn et al. 1). In fact, the network effect strongly outweighs the economic model of giving, which pertains that people would donate to nonprofits simply to aid in the nonprofits’ monetary goal and for the good of the public (Saxton and Wang 854). Moreover, how people react to online charities is highly dependent on the nature of their networks; people whose friends have posted fundraisers, donated, or engage with nonprofits may feel peer pressure to donate themselves – either to impress their friends, increase their social standing in their circle, or simply to keep up with the status quo (Luarn et al. 1). The downside to this, however, is that while people would gladly engage with public fundraisers, they do not seem to care much about efficiency of the campaigns themselves (Saxton and Wang 864). Contributors would sooner “like” a cause or start a fundraiser than actually donate, and when they do, their donations are usually quite small (Saxton and Wang 865). Furthermore, there is a tendency for them to lean towards impulse donating and slacktivism: i.e., people who have the right intentions and motives but not the drive to really follow through with their activism (Bower 23). This, in turn, creates an illusion of activism as donors are driven more by social factors to donate, in combination with a spur of the moment desire to contribute – a desire that wanes rather quickly (Lewis et al. 1). In fact, Kristofferson et al. found that people would sooner go out of their way to contribute more substantially to a charity when their actions were not publicly observable (1149). They created two fake charity groups on Facebook, of which one was public and the other private, and found that people in private groups would be more than twice as likely than people in public groups to volunteer (Kristofferson et al. 1160). In another study they approached college students and asked them to volunteer over the course of a week. One group was given pins related to the charity to wear, another was also given pins but were instructed no to wear them, and the third group was not given anything at all. They found that members of the second group were more likely to volunteer than the other two groups, as members of the first group felt that they were already doing their part by showing visible support to the charity (Kristofferson et al. 1153). Kristofferson et al. claim that this is because people who contribute to a cause privately would sooner be inclined to act according to their personal values, whereas people who do so publicly may already feel that they have done enough by simply showing their support (1162). Furthermore, there being an initial token of support does not necessarily mean that donors will continue to contribute to a cause (Kristofferson et al. 1162). How efficient is Facebook’s birthday fundraiser, then? Bower suggests that companies need to reconsider the effectiveness of online campaigns, as people will lean to slacktivism as soon as their actions become visible to others (23). Contributing to the cause sooner becomes something they would do to impress their friends rather than out of personal interest. And if I’m being frank, my first thought when I stumbled upon the birthday fundraiser was not necessarily a strong desire to support a cause; instead, I wondered which of my friends would see my fundraiser and who would be the ones to donate. While I find Facebook’s birthday fundraiser a lovely idea in principle, had the company’s sole motive been to support charities they might have been better off adopting a strategy that works more advantageously in their favor. Nevertheless, raising some money for nonprofits is still better than raising none at all. Am I going to start a birthday fundraiser myself? Probably not, but who knows, maybe I’ll change my mind when my next birthday rolls around. Bower, Bruce. “Token Gestures: Online Causes May Attract Many More Clicks Than Commitments”. Science News, vol 186, no. 1, 2014, pp. 22-26. Wiley, doi:10.1002/scin.2014.5591860122. Buxton, Madeline. “Facebook Birthdays Have Turned Into Fundraisers, But Is That Such A Bad Thing?”. Refinery29.Com, 2018, https://www.refinery29.com/2018/04/193319/facebook-birthday-fundraiser. Accessed 23 Sept 2018. Nonprofits”. The Verge, 2018, https://www.theverge.com/2018/8/16/17695712/facebook-birthday-fundraiser-non-profit-raised-millions. Accessed 23 Sept 2018. Fleishman, Glenn. “How Facebook Devalued the Birthday”. Fast Company, 2018, https://www.fastcompany.com/40550725/how-facebook-devalued-the-birthday. Accessed 19 Sept 2018. Kelly, Heather. “Facebook Wants You To Say Happy Birthday With A Donation”. CNN Money, 2018, https://money.cnn.com/2017/05/05/technology/facebook-birthday-donation/. Accessed 23 Sept 2018. Kristofferson, Kirk et al. “The Nature Of Slacktivism: How The Social Observability Of An Initial Act Of Token Support Affects Subsequent Prosocial Action”. Journal Of Consumer Research, vol 40, no. 6, 2014, pp. 1149-1166. Oxford University Press (OUP), doi:10.1086/674137. Langone, Alex. “This Facebook Fundraiser Has Raised More Than $20 Million For Immigrant Families. Here’s What Happens To Your Money When You Donate”. Money, 2018, http://time.com/money/5317089/facebook-fundraiser-raices/. Accessed 23 Sept 2018. Lewis, Kevin et al. “The Structure Of Online Activism”. Sociological Science, 2014, pp. 1-9. Society For Sociological Science, doi:10.15195/v1.a1. Luarn, Pin et al. “The Network Effect On Information Dissemination On Social Network Sites”. Computers In Human Behavior, vol 37, 2014, pp. 1-8. Elsevier BV, doi:10.1016/j.chb.2014.04.019. Saxton, Gregory D., and Lili Wang. “The Social Network Effect”. Nonprofit And Voluntary Sector Quarterly, vol 43, no. 5, 2013, pp. 850-868. SAGE Publications, doi:10.1177/0899764013485159. « The new Xbox adaptive controller, another step towards digital inclusion? Is e-mail really for old people? And happy 35th birthday e-mail! Have No Fear…Facebook is here?